To keep chemicals out of our body and the environment. To enjoy better taste, texture & flavor. To avoid artificial growth hormones and antibiotics found in meat and dairy. To support farmers that have invested in growing foods without toxic synthetic pesticides and fertilizers. 1. Start on a trial basis; switch out a few products you already use for their organic counterpart. Gradually replace as much as you can with organic. 2. When it comes to produce know which items matter most. According to the Environmental Working Group, commercially-farmed fruits and vegetables vary in their levels of pesticide residue. To help you make the best choices the EWG has put together a list of the 12 most pesticide-laden produce on the market. Note: These are not items you should avoid eating, rather they are items you should eat organic whenever possible. 3. Purchase hormone and antibiotic free meats and dairy items whenever possible. Studies have shown that organic dairy contains higher level of healthier fats than non-organic milk. Remember you are what you eat. 5. Shop around and find a store that has organic versions of most of your favorite items. Be sure to look for items not only in the organic section but also in the regular aisles. To show you how easy it is to start eating organic I put together a quick breakfast recipe using some of my favorite organic products from Sprouts Market. These hearty pancakes are made with organic whole grain oats, organic Stonyfield yogurt, organic blueberries & fresh nuts. A simple mix of organic ingredients that will fill you up quick and keep you satisfied throughout the morning, exactly what I need when it comes to breakfast! Preheat a greased griddle pan over medium heat. In a food processor, pulse 1 cup of oats until finely ground and resembling flour. In a mixing bowl, add oat flour, the remaining ½ cup old fashioned oats, pecans, cinnamon, baking soda and salt. Stir to combine. In a separate bowl, combine yogurt, egg, oil, and vanilla. Mix until well combined. Pour wet ingredients into dry ingredients and mix to incorporate. Fold in the blueberries. Using a 1/4 cup measuring cup, scoop batter onto pre-heated pan. Gently flatten the batter to resemble patties. Cook for 3-4 minutes, then flip cakes and cook for another 3-4 minutes. Cakes are done when both sides are golden brown and center is set. Optional: Top with lightly sweetened yogurt and blueberries before serving. I have an ongoing relationship with Sprouts. I receive product or compensation for posts featuring their products. As always, all opinions are 100% my own. Wow. Those pancakes look like they'd keep me full for a whole day! Great points on how to start eating healthy! Those looks hearty and filling! My knid of pancake! Breakfast is the toughest meal for me because I am not am morning person. Great tips. Great information, love the tips. And those pancakes....drooling! I have tried to change my diet cold turkey before and it never works - I like the tip of starting with one thing at a time! Those griddle cakes sound perfectly delicious! Great tips for making a gradual switch to more organic products. If only they weren't so darned expensive! What a great cheat sheet for the produce. I buy mostly organic when possible. The pancakes look like a fulfilling healthy breakfast! Love the addition of the pecans. Who could resist blueberries in pancakes? 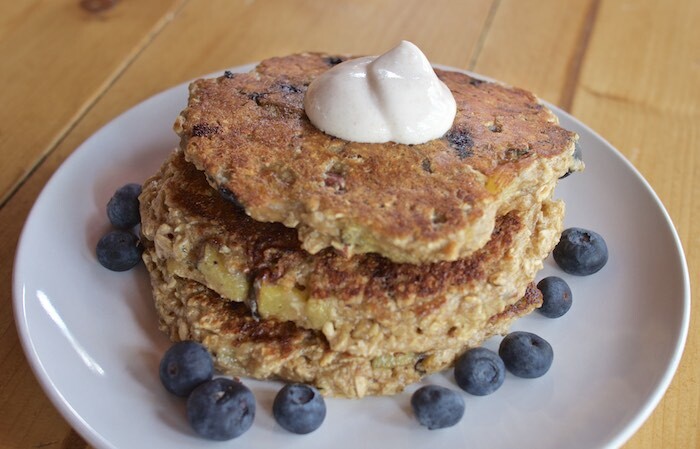 SO many reasons to eat organically...especially with your delicious recipe for Blueberry Pecan Oatmeal Griddle Cakes. They look amazing!!! What a great resource! Ever since having my daughter, I am a lot more conscious of organic foods. Thanks for the great tips, we try to eat organic as much as possible at our house, your pancake sound so good! The pancakes look amazing! My mom is a huge fan of the Environmental Working Group-- they are very helpful in figuring out what's healthy and not for us! I always try to keep that "dirty dozen" produce list in mind when I'm buying fruit and veggies. Those pancakes look like a great hearty breakfast to start the day. Wonderful information! We already eat a mostly organic diet or at least buy from farms that farm organically and those pancakes look great! These look amazing...I agree about the dirty dozen. Such a handy list so we know what is safe. I must give these a try. I really think my daughter would love them...as would I.